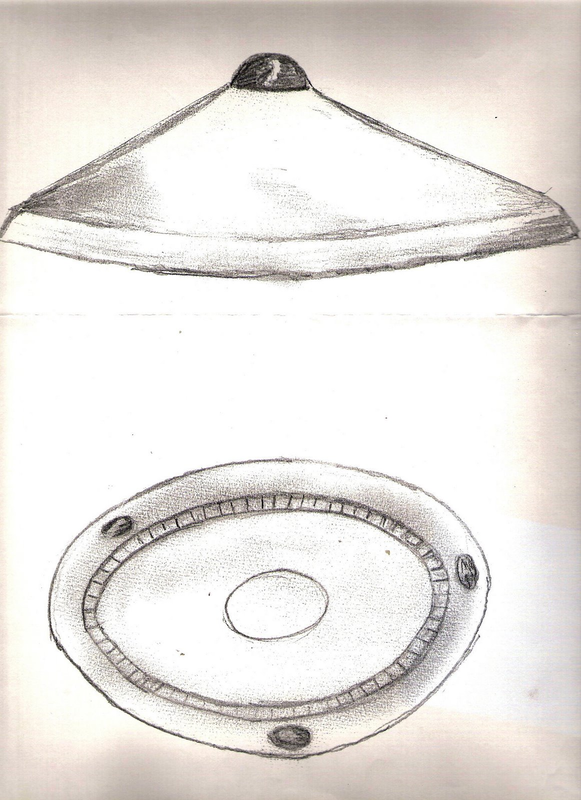 The Westall UFO encounter is an event claimed to have occurred on 6 April 1966 in Melbourne, Victoria, Australia. Around 11.00 am, for about 20 minutes, more than 200 students and teachers at two Victorian state schools allegedly witnessed an unexplained flying object that descended into a nearby open wild grass field. The paddock was adjacent to a grove of pine trees in an area known as The Grange (now a nature reserve). The object then ascended in a north-westerly direction over the suburb of Clayton South, Victoria, Australia. 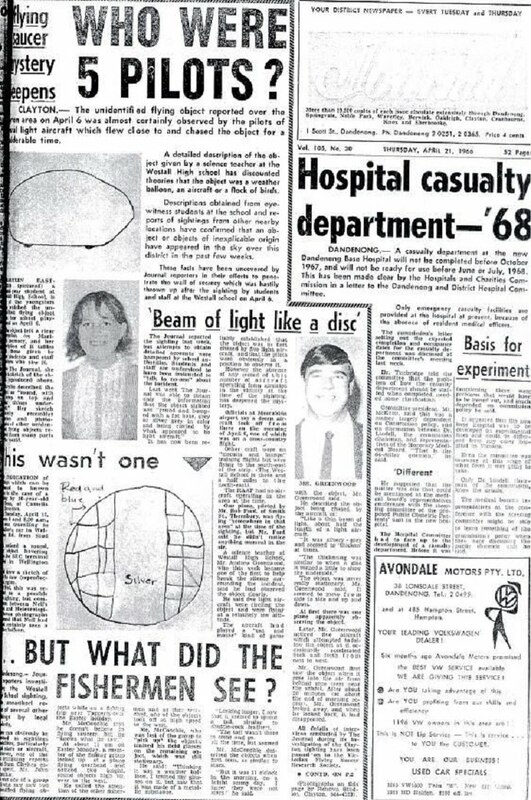 At approximately 11.00 am on Wednesday, 6 April 1966, a class of students and a teacher from Westall High School (now Westall Secondary College) were just completing sports on the main oval when an object, described as being a grey saucer shaped craft, with a slight purple hue and being about twice the size of a family car, was sighted. Witness descriptions were mixed: Andrew Greenwood, a science teacher, told “The Dandenong Journal” at the time that he saw a silvery-green disc. According to witnesses the object was descending and then crossed and overflew the high school’s south-west corner, going in a south-easterly direction, before disappearing from sight as it descended behind a stand of trees and into a paddock at The Grange in front of the Westall State School (primary students). After a short period (approximately 20 minutes) the object – with witnesses now numbering over 200 – then climbed at speed and departed towards the north-west. 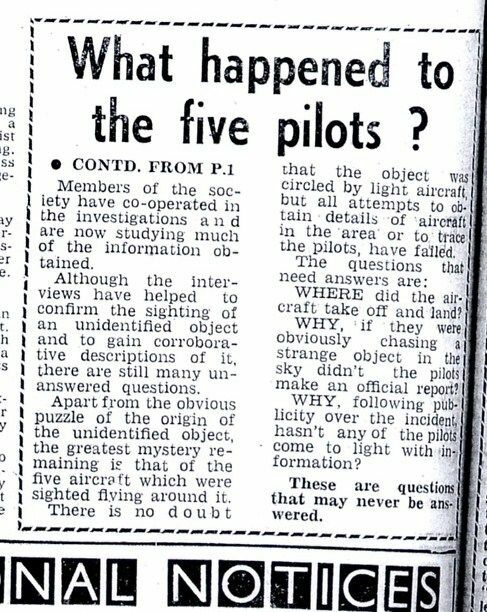 As the object gained altitude some accounts describe it as having been pursued from the scene by five unidentified aircraft which circled the object. 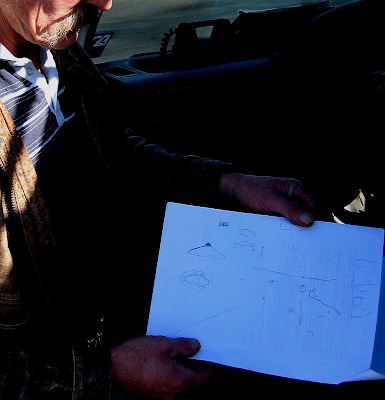 On Sunday, 9 April, the scene was investigated by uniformed men – thought to have been from the Australian Army and RAAF. The local police also visited the location. Witnesses report that samples were taken and the landing site was then burnt. However, some report that the grass was burnt by the farmer who owned the land to stop the children from entering his property. Several of the witnesses report that they were questioned by the authorities or warned against speaking out about what they had seen. The school headmaster, Frank Samblebe, also prohibited discussion of the event. No record of this encounter was preserved in the National Archives of Australia or in the Army or RAAF files. Although government reports are held by some researchers, to date they have never been released. “The Dandenong Journal” covered the encounter in detail and ran two front page stories (see images). The first was on 14 April and the next was on 21 April. 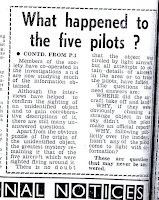 “The Age” ran a very small article about the Westall incident on Thursday, 7 April 1966, page 6. 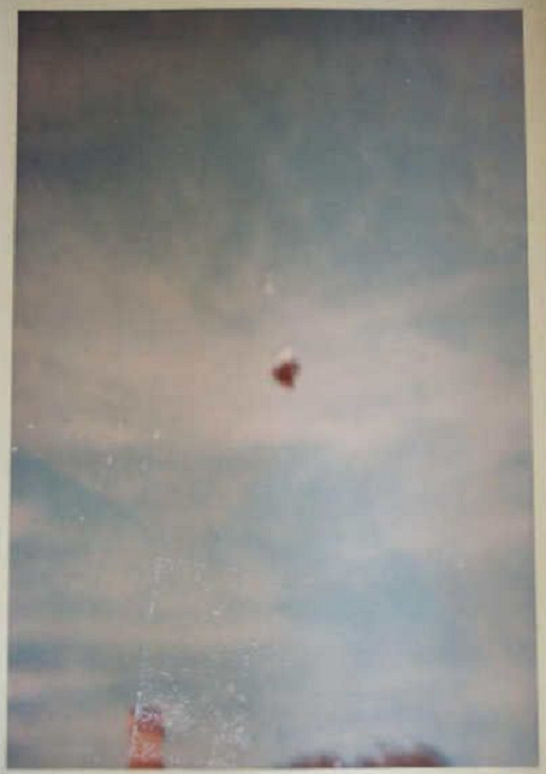 “OBJECT PERHAPS BALLOON – An unidentified flying object seen over the Clayton-Moorabbin area yesterday morning might have been a weather balloon. Hundreds of children and a number of teachers at Westall School, Clayton, watched the object during morning break. They said a number of small aeroplanes circled around it. However, a check later showed that no commercial, private or RAAF pilots had reported anything unusual in the area. The Weather Bureau released a balloon at Laverton at 8:30 a.m., and the westerly wind blowing at the time could have moved it into the area where the sighting was reported”. Witnesses and researchers were surprised when “The Sun News-Pictorial” (a tabloid) ran no story, yet “The Age” (a broadsheet) did. 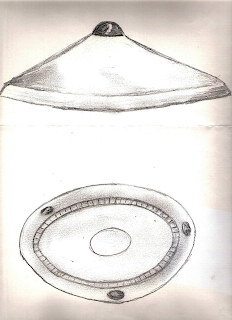 The sighting was investigated by two groups: The Victorian Flying Saucer Research Society (VFSRS) and Phenomena Research Australia (PRA). 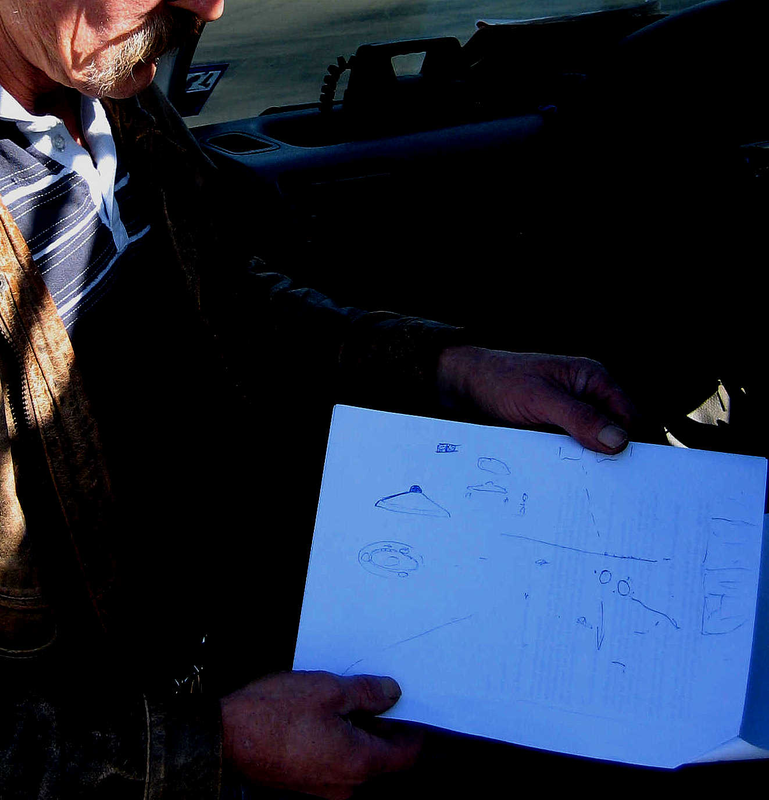 Both groups described it as being one of Australia’s major unexplained UFO cases. The VFSRS team arrived on the site on 8 April and spoke to students and viewed the ground mark. The VFSRS printed an image and a small report in their magazine “Australian UFO Bulletin” in December 2000. An investigator, Brian Boyle (PRA), arrived at the site on 9 April with four army investigators. Boyle did a number of interviews (reel tape) over a number of days and took samples from the ground mark. These investigators were able to speak to many of the witnesses as it was over the Easter holidays (8-11 April). There’s a real Australian UFO mystery coming to SCI FI Channel Australia (you can watch this documentary film below). 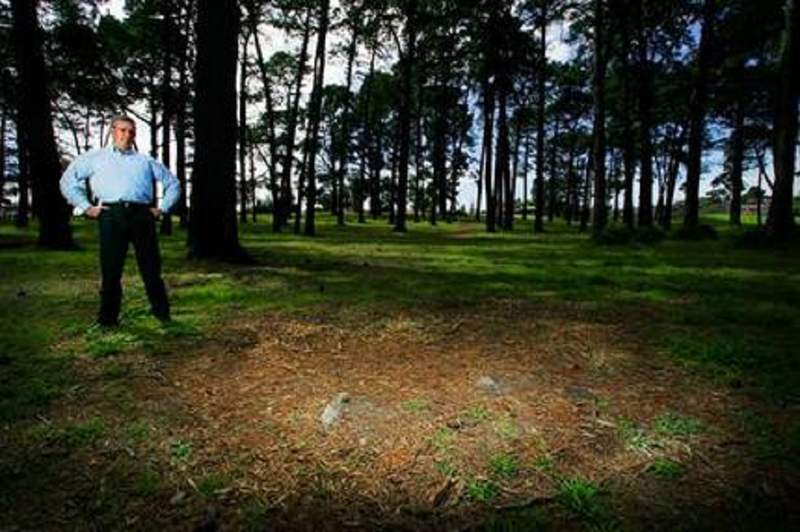 You may think that tales of UFOs are a load of wallaby droppings, but give this new doco, Westall 66: A Suburban UFO Mystery, ten minutes of your time, and you will be scratching your head, stroking your jaw and going ‘hmmm’. It’s one thing to see some crazed X-Files fan emerge from their Arizona-based trailer and gibber on about being ‘probed’, but it’s another thing entirely to hear the level-headed tones of Melburnian Aussies describing in detail what most people on the planet agree can not exist. Flying saucers. Landing in a school yard. In the middle of Melbourne. It is of course, unbelievable. Yet, there’s an entire schoolyard of witnesses, including children (now grown up) and adults (grizzled, yet clear). None of whom come across as wacky in the slightest. It’s a hard one to decipher. Could ALL these people be making it up? Could ALL of them have some weird attention-seeking problem? It hardly seems likely. If not – well, then, we are not alone. Still, you can judge for yourself. It’s a personal investigation by a local film-maker, without the hype that usually comes with the subject matter. Food for thought, it makes compelling viewing. Very much worth checking out (watch below). 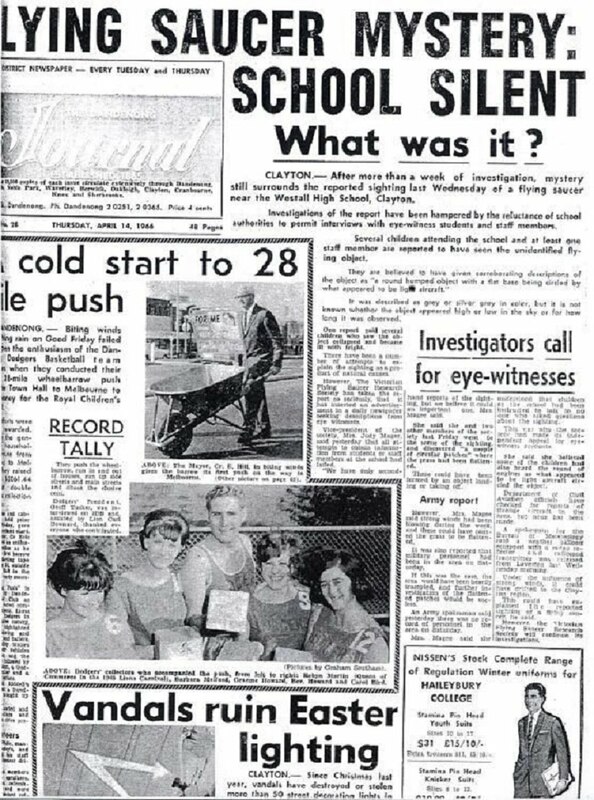 It’s based on the events of 6 April 1966, where, in the Melbourne suburb of Westall, 200 students, staff and local residents watched as a strange object hovered overhead for several minutes, landed briefly, then lifted off and vanished. Witnesses described it as low flying, silver-grey and shiny, shaped like a ‘cup turned upside down on a saucer’ and accompanied by five light aircraft. A mass of excited students surged out of school and ran after the object. Many reported seeing a circle of flattened grass on the ground where it had landed. One said she touched it as it took off. Others observed men in uniforms cordoning off the ‘landing site’ and removing soil samples by the truckload. Some say they saw uniformed men torch the area a few hours later. Just what did flash out of the sky and into the lives of hundreds that April day? Stephen Cauchi reports. Other details are sketchier. The UFO appears to have left a circle of scorched grass; others say several circles were left in paddocks bordering Grange Reserve. 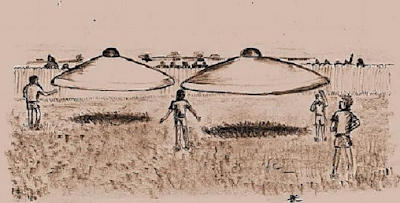 Many witnesses, not all, report seeing aircraft, up to five, trailing the UFO. Some say it made no sound, others say it did. Many reported that police/air force/military personnel inspected the site; some (not all) say the authorities burnt the site. The Dandenong Journal, for which the story was front-page news two weeks in a row, reported that “students and staff have been instructed to ‘talk to no-one’ about the incident”. Nevertheless, one teacher, Andrew Greenwood, gave the paper a detailed account. Ring of mystery: Shaun Matthews revisits Grange Reserve where he witnessed the UFO. Such beautiful colors. I've always been amazed at how lovely quilts come out using so many different colors. Sewing isn't one of my better talents but I can aptreciape the work. These events happen in Africa, South America, NewZealand and now Australia this is very real when there were plenty of witnesses .I say there are alien they are real,Why i don’t understand why the alien did’nt make contact, all i can say everyone that witness this are the chosen ones ,there must of been something very special the entiti liked.